Anyway, the organizer of the event needed new volunteers, because of some last minute drop outs. I guess during the conversation Super Dungeon Explore was brought up as a game that should be suggested to new volunteers. My buddy says he instantly spoke up with a "I know the perfect guy for that", and shortly after messaged me about it. I told him I'd think it over and get back with him. So I started internally debating myself on the subject. I started out as a tentative maybe. The biggest hitch was cash flow, would I have enough money to rent the hotel stay, plus gas, food and some spending money? Do I want to take the time off and screw up the vacation days I've already planned out? Also I've only been to a few conventions over the years, MichiCon and the Michigan Pinball Expo would be the largest of them, I've also attended a few Magic: The Gathering tournaments when I was younger. But I've never been behind the scenes, so this is completely new. But, I've already taught Super Dungeon Explore to a few of my friends and family, so that's nothing new. And I must teach it well, because everyone understands how it works and has enjoyed playing it and wanted to play it again. I also deal with customers and the public all day at work, so I should have no problem dealing with Con goers. As they're basically customers who are interested in the product I'm showcasing. Plus, it's a 3 day vacation playing games and meeting new folks! What not fun about that? So, after a few days of thinking this all over, checking prices and plotting it out. I decided it would be worthwhile and a fun experience. I'll get to get multiple games in and show it off to new people. Not to mention, showing off my SDE paint jobs. I sat down at the PC and started writing out my event sign up, after booking the hotel, and realized... I have too much Super Dungeon Explore stuff. I knew I'd need to filter it a bit, especially so I don't have the players overwhelmed by hero options. But also, I knew I wouldn't be using the whole collection at the con, so I needed to select a specific set. Originally, I was going paint up the base set of Forgotten King to fully show off the new version. But then I decided it would be faster and more interesting to use the Von Drakk Manor, plus the Stilt House Zombies spawning points, along with the new heroes. I already have Von Drakk partially painted anyway. 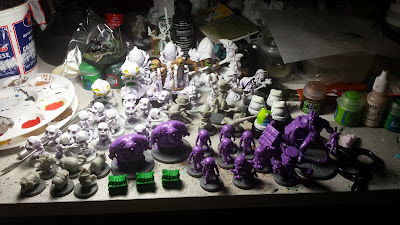 All the SDE minis that need to be finished before Nov. 20th. So the goal now is to finish the Von Drakk Manor and Stilt House Zombies expansion packs, the 5 new SDE:FK heroes, the 3 new Boo Booty minis, the pets and the Rattlebones creeps. Not to mention the new Halloween releases - Beatrix the Witch Queen, Jack Scarecrow and new Ghost Creeps! That gives me 2 Single Spawning Points and 2 Paired Spawning Points to choose from (which in reality I'll only need 1 Single Spawn). But it also gives the players 5-6 Heroes too. Then I decided to scale it back to the 3 hero game, rather than the full 5 hero game, for time. I'll bring the Von Drakk Manor tiles, and Von Drakk/Nocturne for the boss. 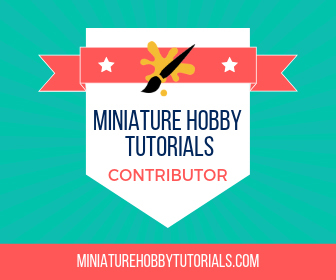 I have 9 weeks to paint 59 miniatures, but luckily a lot of them are groups, so it shouldn't take long. 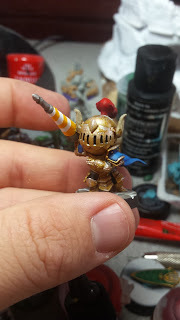 I did start already with Questing Knight, one of the new heroes, and he turned out great. But I need to finish the Araloth project for Paint Hammer's Painting Challenge first. He's nearly finished, maybe a day more of work left. But once that's done, it'll be time to crack out a boat load of SDE. U-Con is being held November 20-22, 2015 in Ann Arbor, MI. There's tons of event happening, special guests and games all weekend. You can find more information over at their website. From what I gathered while talking to the event planner, I'll be running games on Friday and Saturday, but may be doing more. When event sign ups and the schedule is ready, I'll post an update. If you're in the area, come on over and say hi!